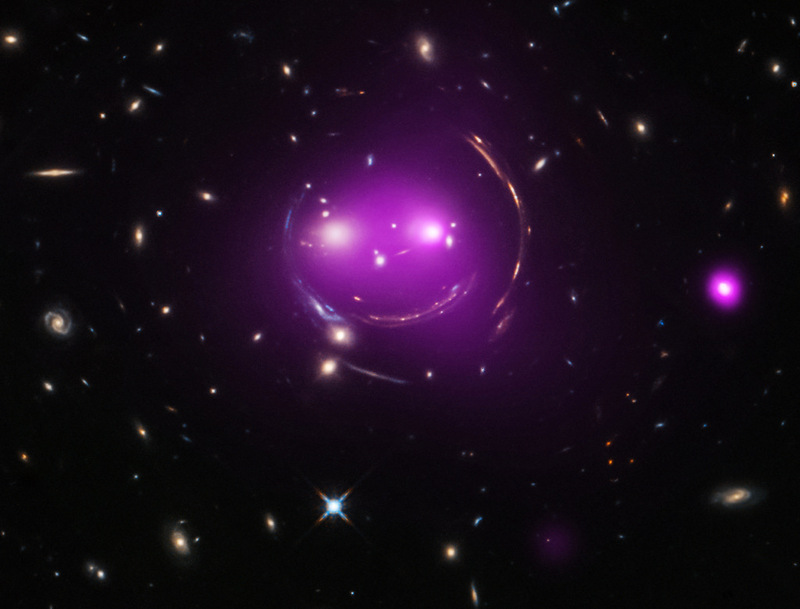 Smiling mysteriously like the Chester Cat in Alice in Wonderland these galaxies are really far away in the deep space some 4.5 billion light-years from Earth. That is close to the current estimation of the birth of the Solar system. The image combines X-ray and optical image data from the Chandra and Hubble space telescopes. The arcs are optical images of distant background galaxies lensed by the foreground group's total distribution of gravitational mass dominated by dark matter. In fact the two large elliptical "eye" galaxies represent the brightest members of their own galaxy groups which are merging. Their relative collisional speed of nearly 1,350 kilometers/second heats gas to millions of degrees producing the X-ray glow shown in purple hues. This effect is known as gravitational lensing and the amount of bending is one of the predictions of Albert Einstein's general theory of relativity. (Classical physics also predicts bending of light, but only half that of general relativity's. Fritz Zwicky posited in 1937 that the effect could allow galaxy clusters to act as gravitational lenses. It was not until 1979 that this effect was confirmed by observation of the so-called "Twin QSO" SBS 0957+561. No - I am not going to argue here about Albert Einstein's Jewish heritage or his relationship with the God of Israel. The point I am emphasizing has nothing to do with Einstein's personal views on science and religion. The theological significance of gravitational lensing is in the way the phenomenon was discovered. So many things in Creation have been found by careful observation, logical theory formation, testing and double-checking the observation. But not in this case. Einstein figured out gravitational lensing by pure mathematical thinking without any experimental evidence at hand. It is remarkable, that while Einstein suggested the bending of light already in the general theory of relativity in 1915, the conclusive proof that he was right was found 61 years later in 1976. Accordingly, there is a hiatus of more than half a century before such equipment had been engineered that could be used to test experimentally this particular aspect in Einstein's theory. But even with best instruments it was still not a simple matter to find that needle in the haystack, evidence of gravitational lensing among billions of stars and galaxies. The quasars QSO 0957+561A/B were discovered in early 1979 by an Anglo-American team around Dennis Walsh (1933–2005), Robert Carswell and Ray Weyman, with the aid of the 2.1 m Telescope at Kitt Peak National Observatory in Arizona/USA. The team noticed that the two quasars were unusually close to each other, and that their redshift and visible light spectrum were surprisingly similar. They published their suggestion of "the possibility that they are two images of the same object formed by a gravitational lens". In the New Testament we have a genuine letter that was written by apostle Paul to the Christians in the capital of Rome in the 50'ies AD. Paul is inspired by the Holy Spirit while writing and scribbles down on papyrus immortal words about the God of Israel - for there is no other real God. while talking about the fallen state of humanity Paul emphasizes the deep thinking of the Creator which is obvious to all in His works. In modern terms we can express this by saying that Creation reflects the mathematical genius of the Creator. With his extraordinary brain Einstein figured out in his mind in a radically new way gravity fields and concluded that they also bend light. Because he achieved this feast just by thinking something in his mind must have reflected the deep reality of the Creation. I do not want to use this "found by thinking" argument as proof that God exists as has been done by many over the centuries. Because true faith in God does not come from intelligent reasoning - it is born from the Word of God and is a gift given to some. However, gravitational lensing has spirituality and even holiness, the nobility and genius of human mind at its sharpest and the sanctity of God of Israel, who has created that mind.